In the fall a knitter's fancy lightly turns to thoughts of warm snuggly socks... or at least, this knitter's thoughts do. I've had a little extra time between homeschooling kids, class planning, writing a sample project for a new job offer and general house cleaning and Thanksgiving preparations this week, so I started some socks. 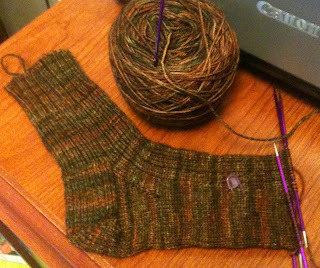 The first as you can see, is nearly done -- just lacks a toe. As I chose a pattern for this gorgeous yarn (Malabrigo Sock - Arbol, in case anyone's wondering), I realized that because my mind was so full of details related to multiple work obligations and home repairs, I needed a simple sock to work on. Anything fiddly at this point, might just put me over the edge. Thinking about it, I put together the elements I like best for wearability and durability in a sock and so far, I think it's ideal, or as my blog title indicates, the "perfect sock." It's nothing fancy, a cuff that's a basic k2p2 rib, but with twisted knit stitches (i.e., through the back loop), and then a basic k3p1 rib for the rest of the sock (w/a basic short row heel and soon a kitchenered toe). There's absolutely not a fancy thing about it -- in fact it's so plain, I'm thinking of adding a picot edging to the top of the cuff just to girl it up a bit. Still, it's been a very satisfying knit. The fit so far is perfect and I'm seriously in love with the color. So happy to have one simple thing in my life right now! Gorgeous, Holly! I LOVE Malibrigo - just ordered more Autumn Forest worsted for a sweater. Happy knitting, friend!